We all like to make slideshow using photos which have our precious memories. But what to do if we have no background knowledge of slideshow, and what to do if we also want to enjoy the slideshow on big TV screen to share with our family members or friends. 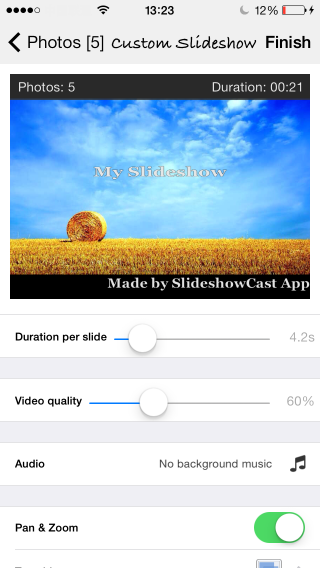 With a simple iPhone app, everything becomes simple which is SlideshowCast. The app can help to make slideshow with photos and music within minutes. With the built-in photo editor, transition effect, watermark, Pan & Zoom effect and audio cut function, even person without any knowledge of slideshow can make professional-looking slideshow quite simply. First download SlideshowCast from iTunes App Store. 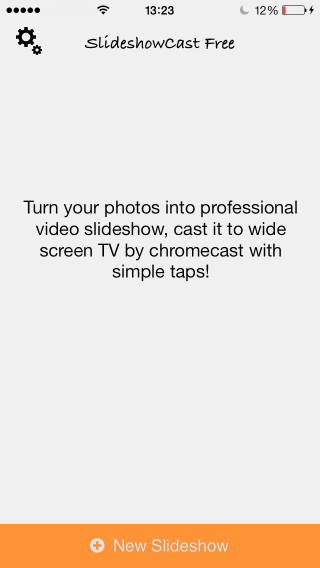 Tap the “New Slideshow” button to create a new slideshow project. Tap the “Add” button to select photos from iphone Photo library/ Camera Roll. Next to the “Add button”, there are three buttons which are “Crop” “Edit” and “Delete”. Select to tap the button and edit the photos. After that, tap the “Next” button which is on the right top of the interface to make settings for slideshow. There are many things you can do with SlideshowCast. Such as set duration for each photo, set quality for slideshow video, add music for slideshow and trim a part out, add Pan & Zoom effect. After all the setting, tap “Finish” to encode the slideshow into video. Then connect iPhone and Chromecast to same wifi network. Next you can enjoy the slideshowcast on TV now. The instruction is about how to burn mov video files onto DVD on Mac. Videos you took by iPhone/ iPad are mov videos, if you want to keep them onto DVD for keeping, it’s very simple to achieve the goal. 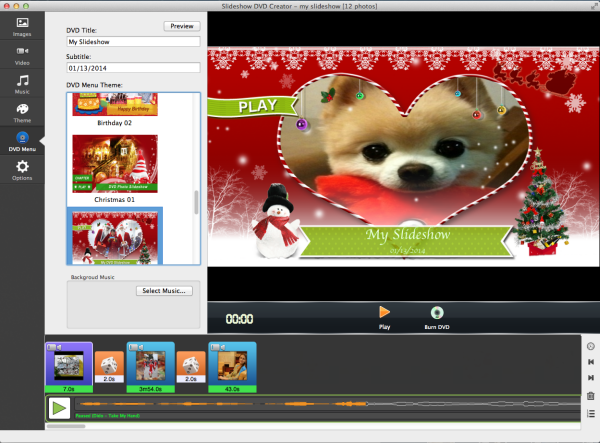 Last time, we talked about how to use Slideshow DVD Creator to create stunning slideshows using photos or music. Now it has the new feature which supports videos too. So you can not only add videos the same as photos and music to make them into one slideshow, but can also only add video files and burn them onto DVDs by the built-in DVD burner. It’s quite convenient. Here we want to show you how to add mov videos files and burn them onto DVD without photos and music. 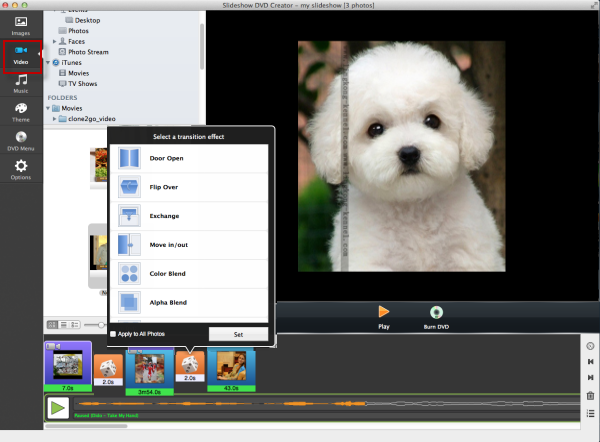 First, of course, you have to download Slideshow DVD Creator to your Mac and click to launch it. If Mac prevents you launching the application, here is a guide to pass the problem : How to install application on to Mac. The page link is : http://www.slideshowdvdcreator.com . After launching the application, click the “Video” tab on the left, next select the video files from the folders which appear next to the panel. Or there is a simple way to do this : drag & drop the mov files directly into the bottom panel to add them. Here we don’t add any photos or music files, so just go pass the “Image” “Music” and the “Theme” tab. In the bottom panel, there is icon between each thumbnail of video which is transition effect. It determines how one changes into another. Click the icon to set it. There also comes the “DVD menu” tab. Here we can set DVD title, subtitle, menu theme for the DVD we are going to burn. If you don’t need the menu, there also has the “No Menu” option. Click “Play” button to see how it looks like. Before you burn them onto DVD, click “Options” tab to make settings. 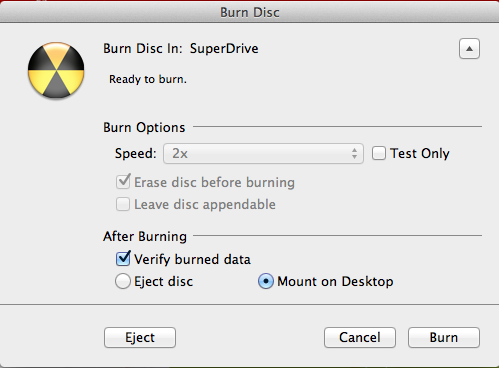 Next, click “Burn DVD” button to burn them onto DVD. This is about how to add photos and videos into one project, add music as background music and make them into dazzling slideshow in a few steps. The slideshow can then be exported to mov or mp4 video format, so they can be shared to Facebook and Youtube, or they can also be burned into DVD to be played through DVD players. Slideshow DVD Creator is a slideshow application, which can help make slideshow simply with the featured transition effects, themes, DVD menu, sync slideshow & music function and other convenient features within minutes. The built-in DVD burner can also help burn the slideshow video into DVDs to play them on TV. At the same time, it is a user-friendly application, even people without any slideshow background knowledge can use it to create professional-looking slideshows. First, download Slideshow DVD Creator to your computer and install it. Next add photos, videos and music to the application using the “Images” “Videos” and the “Music” button in the left panel. Directly drag the videos and photos in the bottom panel to change order. Click the name of the music in the bottom to change orders of music in the popping up dialogue. Click the “Play” button to preview the slideshow. Of course there are more things can be done to make the slideshow more stunning. Click the button between the photo icon to add transition effect, click the time in the bottom of the icon to set duration time of photos and slideshow. If you want to burn the slideshow to DVD, you can also set DVD title, menu and so on using the “DVD Menu” button in the left panel. And click “Burn DVD” to burn it. Encoding slideshow into mp4/ mov is also an option. Set the output format as shown in the screenshot above, then click “Share -> Encode to Movie” from top menu bar to encode it. We all like to take photos to keep memory of our happy times or growth experiences. We also like to share it with friends or family, so they can know our daily life even though we are far away from each other. A slideshow made by still photos and music is good for viewers, and you can also have fun by making it. Pick pictures out, select music which you think is fit for your slideshow. Change the order of pictures, and make some notes into some of the picture. It can help you turn your photos into a film which can transfer your thoughts to others. And you even don’t have to learn any background knowledge. Use Slideshow DVD Creator, you can make a professional slideshow within minutes. Here I will show you how to make a slideshow using photos and music, and export the slideshow as MP4 video format. So you can then upload the slideshow video to Youtube/ Facebook for sharing, or email it to family or transfer it to your mobile photos so you can enjoy it anywhere. First, download Slideshow DVD Creator to your computer for free. Second, after you launch the software, you can see five icon in the left panel, you can click the “Images” and “Music” icon to select folder which contains photos and music you want to use. Then drag & drop them to add them into the software. Then you can drag them directly to change orders. About order of the music, click on the name of music, then you can make change in the poping up dialogue. Third, add transition effects and set time. There are button between photos in the bottom panel, you can click them to select transition effect for you photos. It determines how your photos display. Of course, you can make different effect for each photo, or set one for all photos. Forth, add blank image as cover and add text. You can add text onto your photos to make it interesting.Click “Slideshow” from the menu bar, then click “Insert Blank Image” to add image to slideshow, or click “Add Text” to add text. 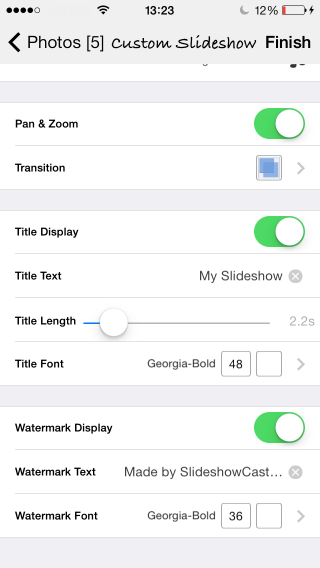 You can set font, color or size for your text. Click “Play” button to preview your slideshow. 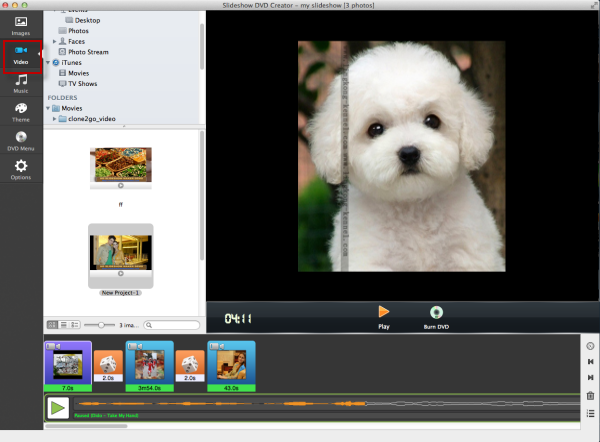 If satisfied, click “Slideshow DVD Creator” in left top corner of your Mac screen to set output video format (MOV or MP4). Finally, Click “Share -> Encode to Movie” from top menu bar, in “Share Video” window, enter title and description, select Video size(such as 1080p). Finally click “OK” , the program will begin to encode the slideshow to MP4. Then you can enjoy your slideshow and share them with others. Once you have created and exported the slideshow video, you may want to delete those albums imported to make slideshows because you they will no longer being used and you want to free up some space on your iOS device. 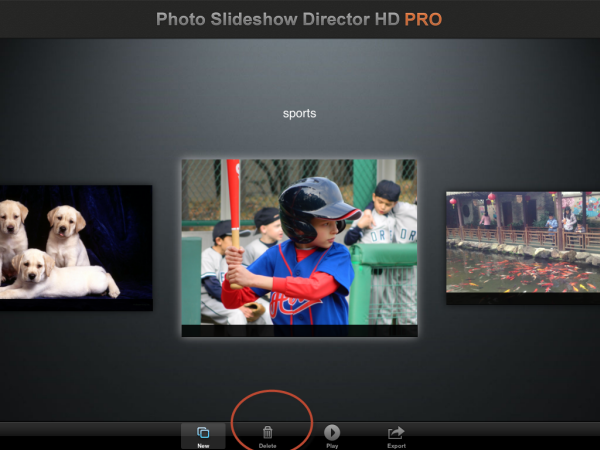 To delete a slideshow project, please run Photo Slideshow Director HD Pro on your iPad, tap on the “Delete” button at the bottom of the screen. Then follow the instructions to delete the project. If you have saved multiple slideshow projects, you need to browse through the projects and make the one you like to delete as the current project. When the target project is selected as current, tap on the “Delete” button to remove it from the slideshow maker on your iPad. We like taking photos as well as showing them to others. We take photos to help us remember the good times, and we show them with others to share the happiness. I think that it is a good option to make the photos into video, then you can enjoy it in big screen with your family at home, or upload it to Internet to share with people all over the world. And you can also insert some songs you loved into the video as background music. For me, “Once” is good for photos taken between lovers, “My little baby” is good for photos for babies. Also there are many good songs you can choose from. Besides, you can at the same time use some transition effect and so on to make your video look professional, and eye-catching. Do not forget to put some short text into the photos to show people your thought. 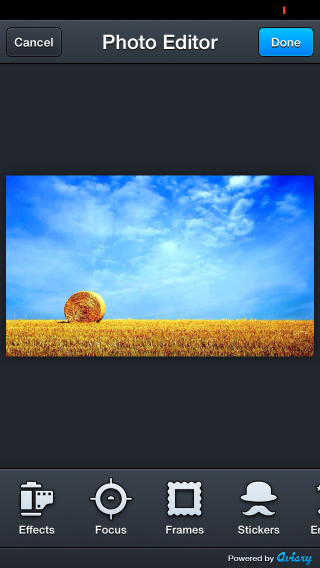 So, here I recommend you to use Slideshow DVD Creator to create such a video. Below I will show you how to do all the things mentioned above. First, please download the software and install it to your Mac computer. The software is free for download, so feel free to have a try. Second, click “Images” from the left panel, then open the folder which contains the photos you want to use, then drag & drop them into the below panel of the soft. Tips: Of course, the order of the photos can be changed. Click icon which appears in the last of the right below panel, which looks like this , then you can manage the photos. Third, now it is time to add your songs. Click “Music” icon, then you can add songs just like the way you added the photos. Tips: 1. you can add more than one song into the slideshow; 2.double click the song name as above, the manage panel will appear. There you can change order or play the songs as you like. Fourth, then you can add text into the photos as mentioned. Click “Slideshow – Add Text” as shown below, then you can add texts. Here you can also change the color, size and so on of the text. To here, the slideshow is almost done. Of course, the software also have transition effect, theme, sync the music and images function for you. You can simply do all these just by clicking the icons in the software panel. Now, it is time to export it to .mov video. Click “Slideshow DVD Creator” in left top corner of your Mac screen. You can set output folder for your video. Select the mov. Click “Share – Encode to Movie”, then a dialogue will appear as below. Here you can set title, description, and video size. Now, you have the .mov slideshow video. Because the iPad, iPhone, iPod all supports this video format. You can also sync it to your device and enjoy.